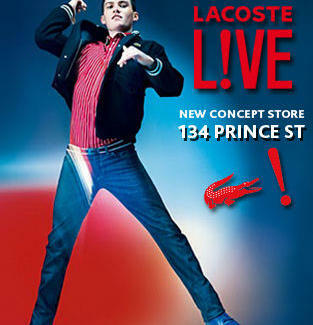 The first ever LACOSTE L!VE store has opened at 134 Prince Street, just in time to kick off Fashion Week. This vibrant conceptual space will offer modern reinterpretations of the classic LACOSTE Codes and Crocodile DNA, creating an explosion of style so overwhelming, you could call it deoxyribo-nuclear. To usher in the boutique, from 9/17-9/19 street teams will be handing out 3,000 red rubber crocodiles throughout SoHo and other downtown 'hoods, to be returned safely (do not mess with the crocodiles) to the store for a handsome reward. The reward's a surprise, but we can say it's not Gilbert Brown, though it will be just as handsome.